My inspiration for having a go at indoor climbing came from watching footage of a breathtaking solo ascent by Alex Honnold. The renowned American climber scaled a famously challenging 1,500ft vertical rock face in Mexico in just three hours, becoming the first person to do it alone. 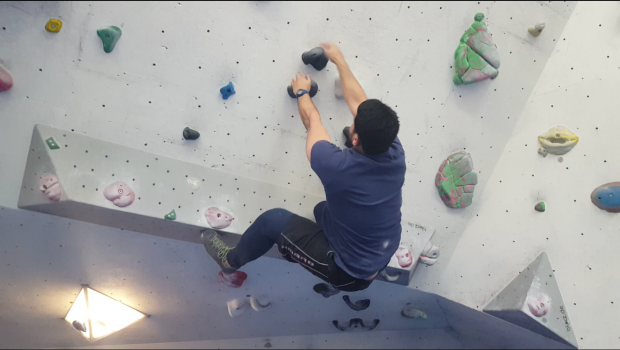 This fantastic achievement led me to tackle the rather less intimidating walls at The Arch, which operates indoor climbing centres in Vauxhall and Bermondsey. The Arch has a range of colour-co-ordinated walls designed to cater for all levels of experience, from complete beginners to gravity-defying experts. Specialising in free climbing, which is climbing without any harnesses or safety ropes. 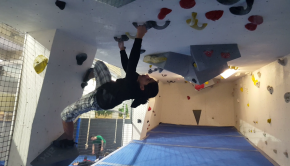 After signing up for an introductory session at the Bermondsey centre for £20, I was introduced to the core skills and techniques of climbing and all the safety aspects to free climbing. If you’ve never been to a climbing wall before the first time could be both intimidating and exciting. An introductory course is required before climbing on your own, and in the early stages, a supervisor or experienced staff member will guide you through essentials to climb. After being shown around the centre, I was then introduced to the walls and levels. For example, green denotes the easiest climbs, and white the hardest. Having an experienced staff member encouraging and helping you get through the climb helps enormously, a great boost for confidence. The most important way to improve your climbing is to continue practising. It’s easy climb but not use the right techniques, but doing it right will help you become a better climber in the long term. One walk-in session costs £10 or memberships are available from £55 per month. The requirements for climbing indoors are having comfortable and flexible bottoms/shorts, t-shirt and your own climbing shoes. The latter can be rented from the centre for £3 or can be purchased in stores such as Decathlon or online. Chalk is also advised as it gives you a better grip; this can be purchased online or the centre at the cost of £1.50. The climbing shoes are always one size less than your usual, this is so your toes can curl which is better for climbing. The main techniques while climbing are route reading, which is analysing the route you will take before starting the climb. Keeping your arms straight makes it easier for you to stretch for the next hold, making your climb easier. Twisting your feet changes your whole climb, it gives you the options to change directions rather than facing one way only. Novice climbers have many falls, but The Arch has soft surfaces so when you slip from the wall your landing is likely to cause any injuries. The most challenging aspect of learning to climb is to keep control of yourself and to stick to the techniques, such as route reading and keeping your arms straight otherwise you end up giving up as you run out of stamina. Free solo climbing is the hardest form of climbing. Therefore, beginning this level straight away can feel difficult but a great way to begin the sport. Later on, you can begin climbing mountains with harnesses comfortably, but it takes years of practice to tackle daunting rockfaces Honnold style. The sport suits extreme sportsmen and women who have no boundaries, and for the ones who enjoy taking the sport a step further such as climbing mountains without harnesses etc. 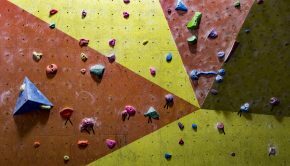 How fit do you need to be to start climbing indoors? I noticed a range of heights but most people at The Arch were in reasonably decent shape. It is tremendously hard to climb if you are overweight, and having good upper body strength, particularly in the arms, is a real advantage. Indoor climbing is a great way to master the art safely, especially at The Arch where you learn how to free climb right away.